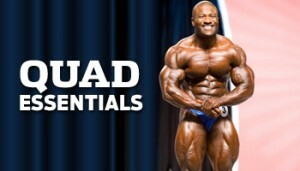 As you will soon see, there’s nothing fancy about Charles Dixon’s quad training. And that’s refreshing. Too many bodybuilders over-think leg day, coming up with pre-exhausting, supersetting, high-rep barrages. Not Dixon. The 5’5″ South Carolina resident beat twenty other pros when he landed in the runner-up spot in last years Europa Super Show 202, and two big reasons why were his left and right legs. He tells how he got those quads — the old fashioned way.